Whether stewed, baked in a crumble or pie, juiced, or in old-fashioned boiled sweets, rhubarb is an enduring flavour and its popularity is on the rise. Originally from Siberia, rhubarb also grows well in the UK climate; in particular, that of Yorkshire. The growing conditions in “God’s Own County, as the region is sometimes known, are so ideal that between the settlements of Leeds, Bradford and Wakefield was an area known as the “Rhubarb Triangle”. This area was home to many rhubarb farmers and, at its peak in the 1930s, the area produced 90% of the world’s supply of winter rhubarb. The Great Northern Railway ran “Rhubarb Specials” express trains, which ran between the Triangle and London and could carry 200 tonnes of rhubarb to the capital each day. For That Boutique-y Gin Company Rhubarb Triangle Gin, all of the rhubarb is sourced from this historic area. Rather than the forced winter rhubarb, which grows in complete darkness, the gin uses rhubarb that has been grown in sunlight, producing a tarter, bolder character. 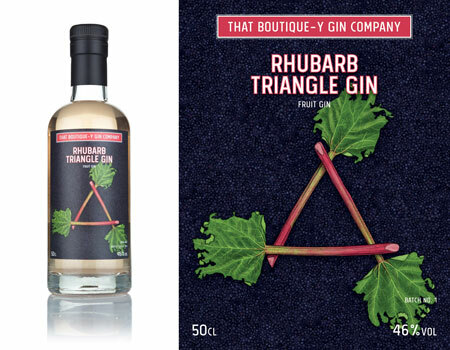 Rhubarb Triangle is made with fresh rhubarb and a base gin with a range of classic botanicals. The result is a complex and versatile spirit that captures the whole spectrum of rhubarb flavour. Nose: The sparkling zing of crisp rhubarb with lemon shortbread. Taste: A voluptuous texture with powerful rhubarb notes coming through, complex and fresh. A zip of citrus, pinch of spice and then the unmistakeable dry flavour of juniper. Finish: Refined and lasting hints of rhubarb crumble, rhubarb soda, and even a touch of rhubarb and custard sweets. Overall: The one word to describe this gin is complex; this spirit takes rhubarb gin to the third dimension. Three luscious leafy stalks of rhubarb lounge on a bed of juniper. The leaves of each stalk have mysteriously grown to take the forms of the coats of arms for the three settlements that make up the corners of the Rhubarb Triangle: the apex leaf is Leeds, the bottom right is Wakefield, and the bottom-left is Bradford. Add the gin, honey and lemon to a heatproof glass or mug and top-up with hot water. Garnish with a pinch of cinnamon or nutmeg. A warming and cosy drink, great to enjoy on those early winter nights. Bright and bold with enough flavour to enjoy even when you’ve got the sniffles. Fill a tall glass with ice, add the gin, then the cream soda and two wedges of lime. For a tarter drink, squeeze one or two of the wedges into the drink. A blast from the past with the use of the youthful cream soda, which adds bright, creamy vanilla notes, almost reminiscent of a light custard. Shake ingredients with ice and then fine-strain into a cocktail glass. Serve with a twist of lemon and (if you have it) a small gingerbread cookie on the side.